Probably the single greatest source of photographic anxiety, loading film is much easier than it used to be — and thanks to point-and-shoot innovation, easier than most people think. Here’s all that you ever need to know about loading film into a 35mm point-and-shoot. Nothing gives away an amateur like tentative or prolonged film loading. Master this stuff, and you’ll look like a pro. Most 35mm point-and-shoots have automatic film loading. After you close its back, the camera automatically advances the film to the first frame. But what cows people is the film leader — the little strip of film that protrudes from the cassette’s lightproof lip (see Figure 1). The leader starts out perforated on both sides (as is the film inside the cassette), but tapers to a short half-width strip with perforations only on one side. After the cassette is in position inside the camera, you pull the leader across to the film take-up spool, which automatically engages it after you close the camera back. In the middle of the inside of the camera is a rectangular opening though which you can see the back of the lens. This rectangular opening is where each frame of film rests as you shoot it. On either side of this rectangle are two chambers. The large, empty one is where the film cassette goes. With some models, it’s on the left; with others, it’s on the right. Figure 1: The view inside an open 35mm point-and-shoot. The loaded cassette’s film leader has been extended to the film tip mark. 2. Nestle the film cassette into the empty chamber. You can’t just drop the film cassette in. Notice that the cassette has a small cylindrical protrusion at one end, called the spool hub. This protrusion must fit into a small recess in the film chamber. Notice, too, that there’s a little spindle extending into the film chamber, from the top or bottom. You have to slip the flat end of the cassette — the end opposite the spool hub — over this spindle as you fit the cassette into the chamber. The process sometimes takes a little nudging and wiggling. 3. Grasp the leader and pull enough film from the cassette so that the leader’s front edge lines up with the film tip mark in the opposite chamber. The film tip mark is often, though not always, colored orange or red. Pull gently on the leader, keeping a finger on the cassette itself so that it doesn’t lift out of the chamber. Lie the film flat across the rectangular opening to see if it reaches the mark. If it doesn’t, pull it out a little more. After you get more comfortable pulling film out of the cassette, use your thumb to press against the top edge of the film and push it along its path, as shown in Figure 2. This technique helps you gauge how much film to pull out. Just be sure not to press against the rectangular opening. With compact cameras, you don’t need to pull the film out more than a few perforations’ worth; with bigger models, rarely more than 1/2 or 3/4 of an inch. But you don’t have to be especially precise about the amount of film you pull out. Some models seem more able than others to handle excess film. None, however, can grab the leader if it’s physically too far away. So err on the side of more film rather than less. Figure 2: One way to extend 35mm’s film leader is to slide it across with your thumb. 4. Now press the whole film strip flat against the rectangular opening, double-check that the cassette is snugly seated, and then close the camera back with firm pressure until it clicks. The camera’s take-up mechanism and winding motor should engage the film and advance it to the first frame. The camera’s frame counter or LCD panel then displays the number 1. 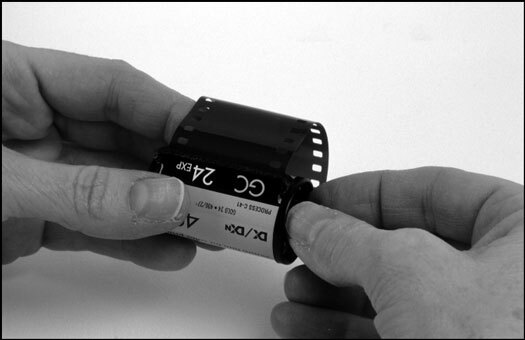 If you pull too much film out of the cassette when loading it — or not enough — the camera may not advance the roll to the first frame (see Figure 3). If this happens, you must open the back and reload the film. Figure 3: Don’t pull too much film out of a 35mm cassette when you’re loading it — or too little. Fortunately, a 35mm point-and-shoot tells you (after you close the back and it attempts to engage the leader) if you pulled out too much film — or if you didn’t pull out enough. It gives you this warning, if it has an LCD panel, by blinking an icon of the film cartridge and/or the number 1 or an E (for empty). Models without LCD panels simply fail to move their mechanical frame counters to 1. To fix the problem, open the camera back. Pressing the film flat against the camera, check again to see whether the leader lines up with the film tip mark. If it’s short, just pull out a little more film and close the camera back again. If you pulled out too much film, take out the cassette. Hold the cassette between the thumb and fingers of one hand and point the spool hub toward you. Grasp the spool hub with the thumb and forefinger of your other hand and rotate it counterclockwise to draw the leader back into the cassette (see Figure 4). This rotation may not appear to have an effect until the coil of film inside the cassette begins to tighten up. Continue to turn the spool hub until the half-width portion of the film is a few perforations away from the cassette’s lip. Rotate it slowly, so that you don’t accidentally pull the whole leader back into the cassette. Figure 4: To draw excess film back into a 35mm cassette, rotate the spool hub slowly counter-clockwise. Now load the film as by following the steps as though for the first time. If you pull out too much film again, just repeat the process. Do not rotate the film cassette’s spool hub in a clockwise direction. It puts up a lot of resistance if you try, and doing so may cause damage to the film.